For a dinner I served this with a simple leaf side salad with my most favourite balsamic dressing - it really goes nice with the roasted veg. The first time we made these we made them "pizza like" with a store bought pizza sauce and supermelty cheezly mozza. It was very good but I got to thinking that pesto would be lovely with the roasted veg. So I decided on a creamy pesto using soy cream instead of olive oil so it wasn't overly oily and nice and creamy. 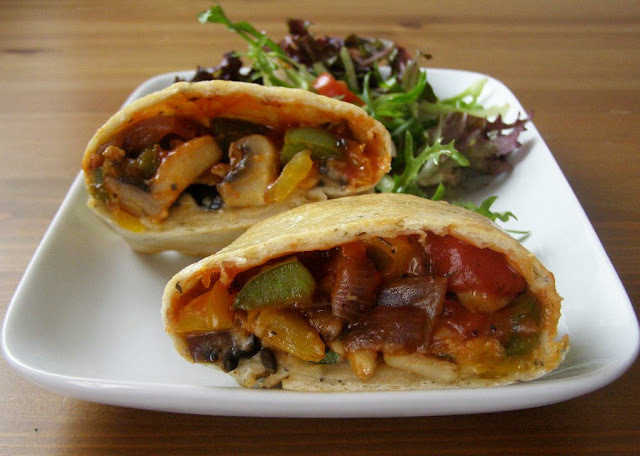 Roasted Vegetable Calzones - makes 3.... or 2 huge ones! 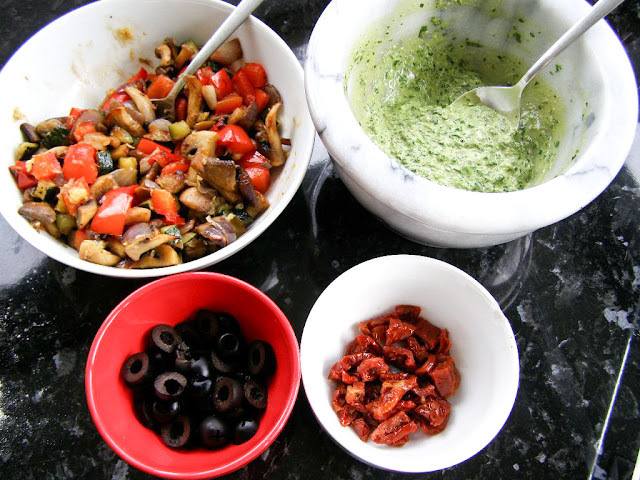 Creamy Pesto: this is so good you may want to make more to have on hand! First make your dough. In a bowl weigh out the flour, salt, mixed herbs and garlic powder (if using). Mix well and set aside. In a large bowl add the hand hot water and the sugar. Whisk until the sugar dissolves then sprinkle over the yeast. Let it sit for 10 minutes - it should get really foamy on the surface. If it doesn't, your yeast is 'dead' and you'll need to dump this and get some new yeast! After 10 minutes, whisk it up well, add the olive oil and whisk again. Stir in the flour mixture with a wooden spoon until a dough comes together. Flour your work surface then knead the dough for 10 minutes. Keep adding more flour until the dough no longer sticks to the surface or your hands. When it's close to 10 minutes you should notice that the dough becomes very smooth, soft to the touch and is no longer floury or sticking to anything. Now wash out the bowl the dough came out of with really hot water and dry. I like to add the dough to a warm bowl to 'kickstart' it's rising. Add 1/2 tsp of olive and grease the bowl then add the smooth ball of dough, turning it to cover in oil. 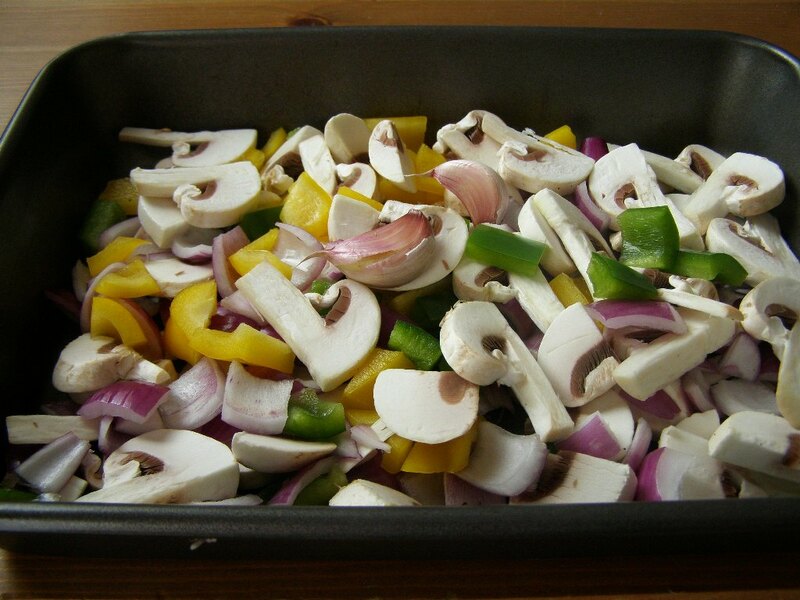 Cover the bowl with cling film and leave in a warm place to double in bulk - about 1 hour. Now prepare your roasted veg. Preheat the oven to 220C. 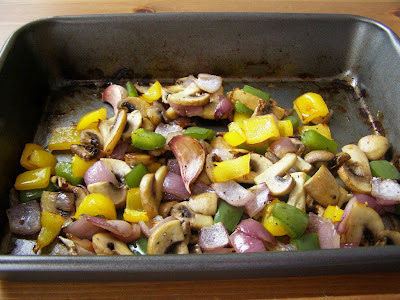 In a non stick roasting tin add the garlic, mushrooms, red onion and peppers. Drizzle over the olive oil and toss with your hands until it is all coated in oil. Sprinkle over the salt and some freshly ground black pepper. Resist the urge to add more oil - the mushrooms will release water while roasting and it's not necessary. Pop it in the oven for about 20 - 30 minutes, giving it a stir a couple times. Slice the tops off the garlic and squeeze out the roasted garlic, mash it well with a fork then add to the roasted veg mixing well until all the garlic is spread about evenly. Set aside to cool slightly. If making the pesto version, now make your pesto: Either use a food processor or pestle and mortar, whatever will give you the finest texture result. Place the toasted pine nuts, garlic, salt, lemon juice and basil in and grind until nice and fine. Slowly add the soy cream until all added and nice and creamy. Stir in the finely ground nutritional yeast and some ground black pepper. Set aside. Now, remove the dough from the bowl, punch down and cut into 3 sections. Roll out both sections into rough circles, not too thin. 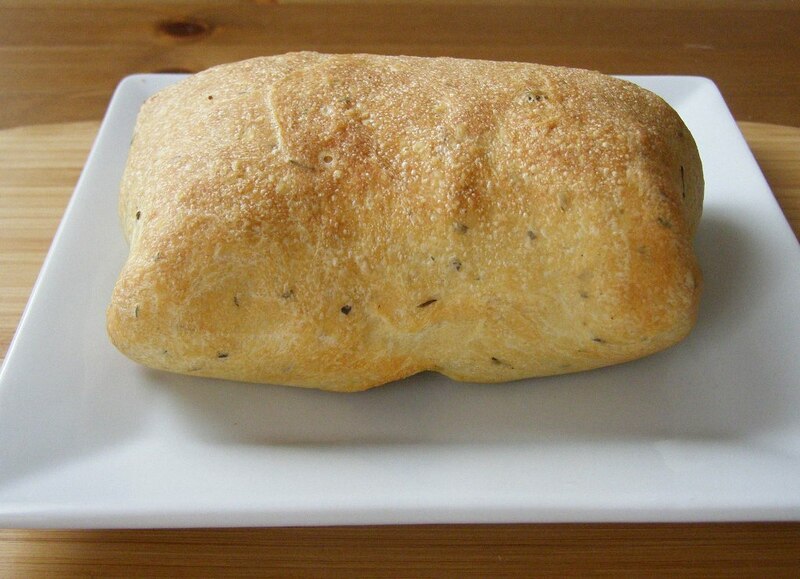 If you are making 3 calzones here then they will look small, but as you can see from my pictures, it does all get in there! This photo from 2012 with slightly different veg and added zucchini. 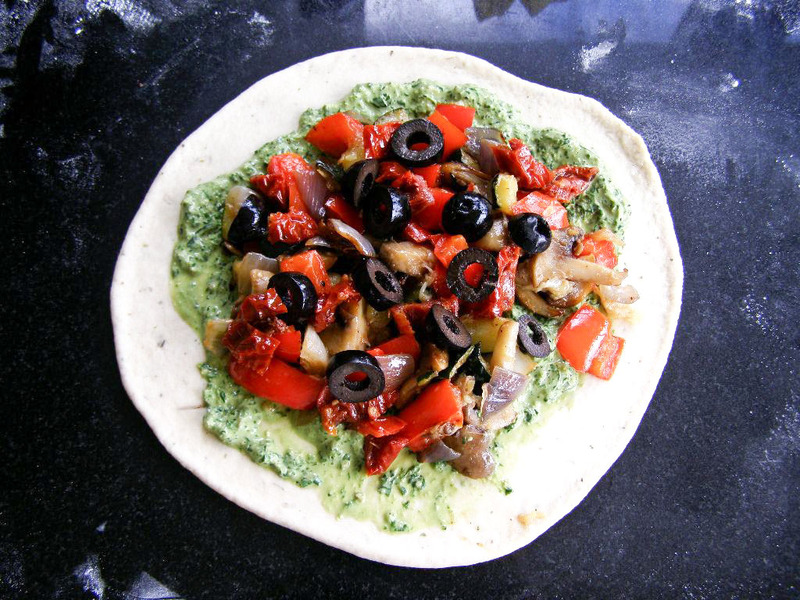 Either spread on the pizza sauce or half the pesto, then top with the roasted veg, black olives, sun dried tomatoes and chopped marinated artichokes. If you are making the pizza sauce version, add some cheezly if you like, I've made these with both melty and regular, they both melt fine but the mozza gave the best flavour. I also added some chopped basil to the pizza sauce. Now take 2 sides and bring it together over the top and seal well, do the same with the other sides then make sure you seal all the edges. 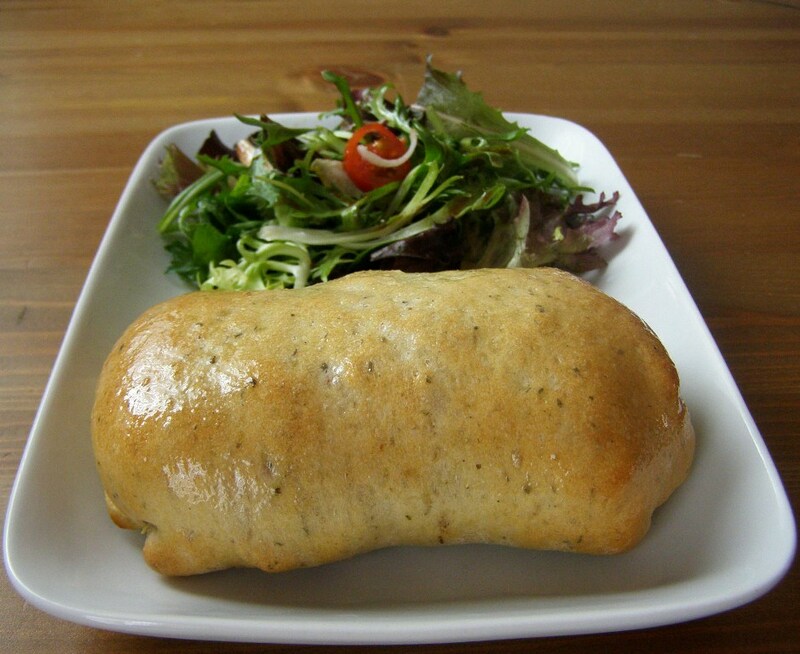 Line a baking sheet with baking paper and place the calzone seam sides down. Brush with a little olive oil and bake in a preheated 200C oven for about 15 minutes, or until golden brown. Let sit for 5 minutes to cool slightly then serve with a simple leaf side salad. Measure the olive oil into a small bowl. With your whisk ready slowly start adding the balsamic vinegar in a steady stream, whisking all the while until it's all added and thick and creamy. Whisk in the dijon, salt and garlic. Add a few grinds of black pepper and whisk again. This will make more than you need for a side salad but it will keep a couple days. Just whisk it up again. Yum, yum, yum. I'm definately going to attempt this. Do you think it'd work with wholewheat flour? Thanks Char :) I don't see why not but unfortunately I don't use wholewheat flour all that much, except to make brown bread, so am not too sure if you could swap like for like or if a blend would be best...worth experimenting for sure! I happened upon your blog through a pin by Rose Pedals on Pinterest. Now I can't stop looking at your recipes! 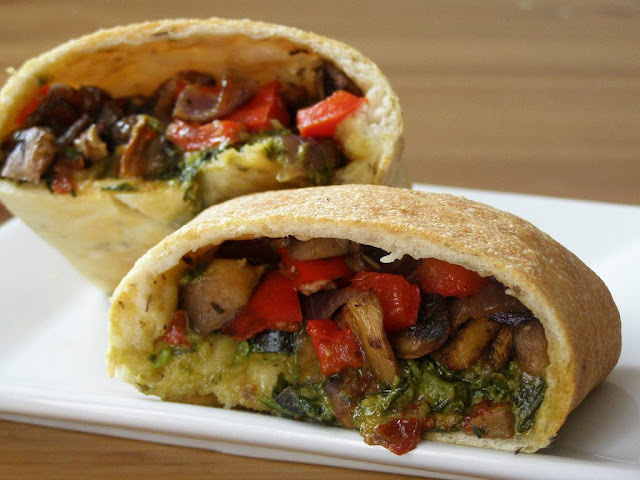 I've been trying to find a way to make a yummy vegan calzone. This dough looks and sounds perfect, and I can't wait to try it (maybe I'll setting up a calzone bar for Thanksgiving...).